She fumbled with her seat belt. Nervously mashing one piece of the buckle into the other, shaking so vigorously it could have been mistaken for a poor joke. She finally clicked the metallic pieces in. Airline belts are like the dodo bird, unusual in nature and generally useless. Still shaking, she shifted in her tiny, long seat. Turning her head to look out the window but never really seeing. There was too much on her mind. Flustered she would appear to the man who hesitantly sat next to her. Every few seconds she would clear her throat. Not too loudly but just enough for him to consider sly ways to change seats. As she sat there feeling nothing, staring at nothing, she overheard women behind her talking about a teaching program. “No really. You see, my father died today. At 11 am. He lived a great 91 years. “But anyway, I’m not very cheerful right now. She actually said this all incredibly cheerfully. Ironically even. But she didn’t notice. All she wanted to do was sleep. Sleep it all away. Maybe some cold OJ would help. Not peanuts, no. It’s disorienting when your mind is completely bare but your heart is heavy with pressure. Is it still beating? Or is that pounding in my head? The OJ didn’t help with her shaking. He shut the air vent. Is it cold? I can’t remember the feeling. She touches her neck absentmindedly, surprising herself with the feeling of skin on skin. His hadn’t felt like any skin she had touched before. But it reminded her what cold was. Now she needed to hold herself from shaking too hard again. She had frizzy, curly, dark, short hair. She wore glasses with a titanium rim. Round and wide like her. Jewelry that matched. Gold earrings, three rings, a gold bracelet, and a gold, half moon shaped necklace with diamonds in it. She was married but alone. Big belly, boney knees, big ears, normal sized hands. She was wearing khaki shorts and a sky blue shirt with a white, patchy, brush print. The experience of sitting by a window on a plane is completely dependent on the time of day and how close you are to the wing. When it’s utterly pitch black, sitting by a window can feel like being in space or having your eyes closed. She remembered when she was a young girl she loved sitting in her closet in complete darkness and opening her eyes as wide as possible. And then closing them tightly. Reaching, straining to make the shapes she knew were there appear. Whiffs of white, brushes of pink, lightning blue. Thinking back it occurs to her that those colors and lights never existed. They were made up by her mind because she wanted to see something in the darkness so badly. 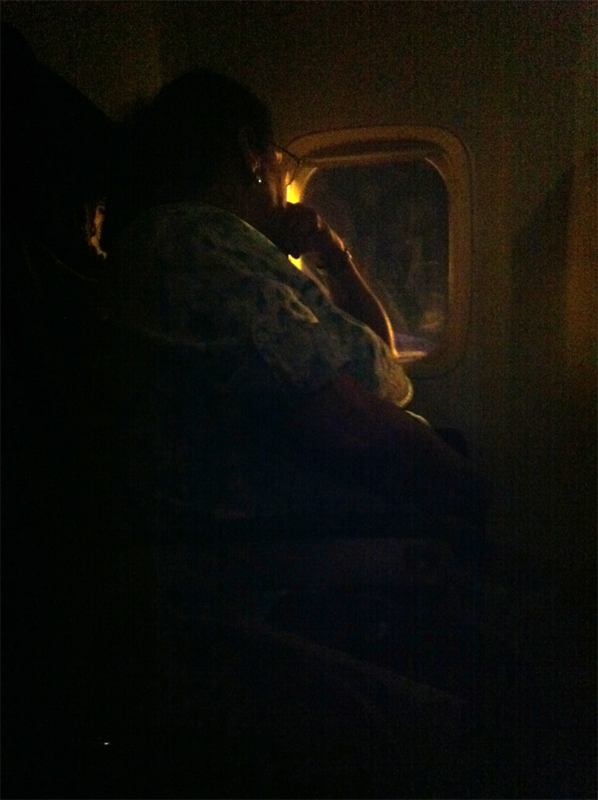 Now as she stares out the airplane window that yearning returns. She closes her eyes tightly, and clenches her fists, wanting to see something in the darkness. Wanting to feel something else in her heart. → I hate writing about love.